The Amazon Kindle Fire HD is the latest incarnation of the Kindle, the Kindle Fire HD runs movies and HD video in 1280x800 resolution and runs on the Android OS but with Amazon integration. The screen offers vibrant color and contrast from pretty much every angle, it has advanced polarizing filter and anti-glare technology. 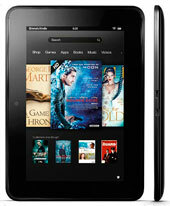 Amazon supply streaming movie and TV show downloads as well as books and music. Display 7" 10 point capacitive touch high definition colour display; 1280x800 resolution, video playback at 720p, with IPS (in-plane switching) technology, advanced polarising filter, Gorilla Glass, and anti-glare technology.